The adrenal gland is a small triangular gland located on top of the kidney. 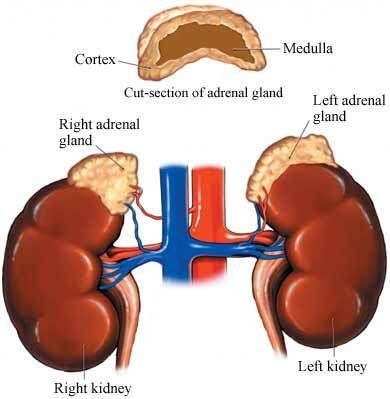 Adrenal glands are orange-coloured endocrine glands that are about one-half inch tall and three inches wide. The gland consists of a medulla and is surrounded by the cortex. It is responsible for producing epinephrine and norepinephrine, as well as the hormones related with stress through the process of corticosteroids. One of the main functions of the adrenal gland is to work with the hypothalamus and the pituitary gland. The hypothalamus produces corticotrophin-releasing hormones that stimulate the pituitary gland and, in turn, the pituitary gland produces corticotrophin hormones that stimulate the adrenal glands to produce hormones called corticosteroids. The cortex of the adrenal gland is chiefly responsible for the synthesis of the corticosteroid hormones taken from cholesterol. In normal conditions, the adrenal gland produces about 35 to 40 mg of cortisone acetate each day. The adrenal cortex consists of three layers: the zona glomerulosa or the outer layer is responsible for the production of mineralocorticoids which, in turn, is responsible for the regulation of blood pressure ; the zona fasciculate, which is responsible for the production of glucocorticoids; and the zona reticularis, which is responsible for the production of androgens in humans. The medulla is the core of the adrenal gland; it consists of chromaffin cells, which are the body’s main source of cateccholamiones adrenaline and nonadrenaline. These come from tyrosine and are responsible for the person’s “flight or fight response.” The flight of fight response is a common reflex in most humans as well as animals when faced with a threat. The most common complication of the adrenal gland is what is known as adrenal gland disorders. These involve several conditions that affect the normal functioning of the adrenal gland, which is characterized by adrenal insufficiencies. Adrenal gland disorders can be caused by several factors. A person diagnosed with this condition should be treated right away, as this can be a life threatening disease if left untreated. The adrenal gland is chiefly responsible for producing a lot of essential hormones for both men and women. These hormones are necessary for one’s body to function properly. People who have adrenal gland disorders produce either too much or too little of the necessary glands in the body that may lead to several other complications. Tumours found in the adrenal cortex can result to the overproduction of hormones. Tumours in the adrenal cortex are round and yellow and may lead to a lot of complications. The presence of such tumours can be a reason for the removal of the adrenal gland. Tumours found in the adrenal medulla can also be another reason for the removal of the adrenal gland as they can result to the overproduction of adrenaline. Cancer of the adrenal gland. When cancer cells are found, the adrenal gland has to be removed to stop the cancer from escalating. The adrenal gland is an important part of the human anatomy and any complication can have serious implications to the overall health of the individual.